Shopping is part of our routine and unfortunately it can’t really be avoided but this doesn’t mean that we can’t find ways to make it a more enjoyable experience with different handmade, stylish and personalised carrier bags?! Shopping bags don’t only have to be practical ; they can be fun and can be important fashion accessories, part of your overall look. 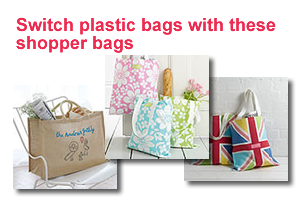 Also, we encourage you to support efforts to reduce the use of plastic bags from retailers. With a more responsible approach, we can contribute to the waste reduction, prevent litter and keep our environment clean! Our shopper bags selection includes an unbleached cotton canvas bag to give you an eco-friendly look, the Breton cotton bag to add a French touch to your look, a shopping bag that can be embroidered with your child’s drawing (how cool is that for your kids!!). It also includes the colourful Union Jack shopper bag perfect for taking on shopping errands or trips to the coast (great beach bag! ), a lovely Blossom shopper bag to brighten up your trip to the grocers this summer and finally the classic camper van printed cotton bag.